Going to Hanoi, Vietnam? In this installment of our Vietnam Travel Guide Series, we bring you the best things to buy in Hanoi. Don’t leave Vietnam without them! When it comes to shopping, there is no lack of choices in Hanoi for you. This vibrant city offers a large selection of ethnic minority souvenirs, hand-made crafts and soft silks. You’ll just need to walk through the 36 streets of the Old Quarters to experience the shopping culture of Hanoi. What to buy in Hanoi, you may ask? In this article, we will list down our Top 10 items to buy in Hanoi. Before you hit the streets, have a look at our top Hanoi shopping tips. Vietnamese silk is one of the best things to buy in Hanoi. It is available all over the Old Quarters, but mostly concentrated at Hang Gai (silk street). However, unless you are an expert, it will be difficult to differentiate between the fakes and the real deal. Tip: The locals recommend bringing along a lighter – 100 percent silk will burn while acrylic will just melt, giving off the smell of burning plastics. Stick to the more established shops if you are keen to buy in large quantities. For eg, Khai Silk located at 96 Hang Gai is an established shop which is popular with tourists. Ha Dong Silk at 102 Hang Gai Street and Tan My at 66 Hang Gai are also worth visiting. However, you do pay for the quality as prices are higher than the other shops. If you want to buy good quality silk at cheap prices, a Vietnamese friend recommends going to Van Phuc Silk Village. It is not a colourful, bustling village for tourists, but really just a place where silk clothing are weaved and sold at good prices. In the olden days, young ladies in wealthy Chinese families must learn embroidery, for it is considered a refined art. Today, much of this skill is lost, but it still lives on in the cities of Vietnam. Embroidered fabrics are seen commonly at the Old Quarters and at Dong Xuan market. These are usually the coarsely made ones but they are nevertheless still impressive. The finer embroidery sold at galleries uses premium silk threads and skilled embroiders and can cost up to a few hundred US dollars for a small piece of work. You will marvel at how life-like these embroidered artwork are. Lacquer ware is one of those items that I would strongly recommend that you buy in Vietnam. They are available at department stores in Singapore, but they come at exorbitant prices. Lacquer ware are well made in Hanoi, and they have even more and better designs than what is available over here. They come in all forms – plates and dishes, coasters, wine holders, jewellery boxes etc. Although bulky, they are pretty lightweight and easy to carry back home. It makes for a great gift or as decorative pieces for a modern home. Be impressed by the modern and exquisite artwork on lacquer. Lacquer paintings are created by coating the wood with layers of resin, each dried and sanded before the next coating is added. They come in various sizes and designs and make a wonderful gift for a loved one. It came as a surprise to us to see good oil paintings along any street in Hanoi. While the lacquer paintings are impressive, the country also has a rich tradition of canvas painting. Other than the localized flavours of conical hats and padi fields, there are also a great variety of westernized paintings, many of these are imitations. If something catches your fancy, haggle hard for it. We have seen foreigners buying paintings for the price they successfully bargain for. Tip: Head to the corner of Hang Be and Hang Bac to get good imitation copies of paintings. Hand knitted pouches, wristlets, pencil cases, wood carvings, traditional masks and other memorabilia can be found all over the Old Quarters and are best suited as souvenirs for friends. These shops can be found near the Hoan Kiem Lake and the water puppet theatre. 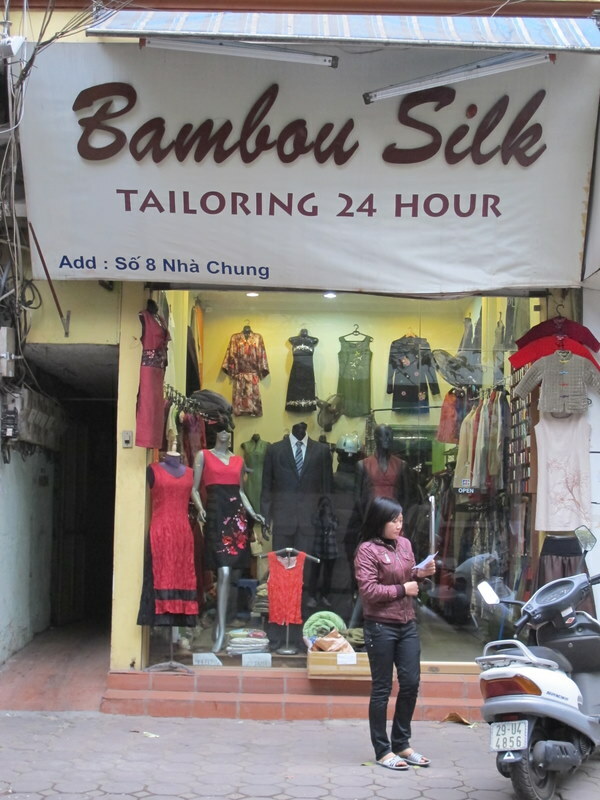 Hanoi has a great selection of boutiques that carries quality and fashionable products. However, prices are not as cheap as Bangkok. A simple dress off the rack cost me about SGD25. Those at the higher end boutiques can range from about SGD40-100. If you catch anything of your fancy on the rack and it does not fit you, try asking the shopkeeper if they can tailor one of your size for you. It should come at no extra charge. Alternatively, bring cut-outs from magazines of fashion that you like and get them to tailor make it for you. If you are really keen on custom making, do it on your first day at Hanoi to allow time for fitting and adjustments. Tip: Turn clothes inside out to check the quality of work along the seams. As good as it looks on the outside, it must also be quality work on the inside. A friend came back from Hanoi raving about the authentic North Face and Crumpler bags sold all around the Old Quarters. She stuffed her luggage full of these purchases but it was all fake stuff. Vietnam may be the place of manufacture for these brand names, but what is sold at the Old Quarters of Hanoi are mainly poorly made imitations of the real thing. I’ve ploughed through almost every shop at the Old Quarters and have yet to come across an authentic North Face product. Tip: Fakes are easy to tell – just have a look at their zippers (authentic ones have good and sturdy zippers that slide across smoothly), the shoulder pads (authentic ones have luxurious paddings while fake ones have none at all), the back padding (again, authentic ones have sturdy backings and generous amounts of cushion) and the material used (sturdy vs cheap polyester). Nevertheless, if buying an authentic backpack is not at the top of your list, and you can get by with just any bag, then Hanoi is actually a very good place to get them. A medium sized backpack with a North Face logo can cost as low as USD10 before haggling. Bag shops are mainly clustered around Hoan Kiem Lake and the water puppet theatre. Hanoi is an excellent to stock up on household items, including ceramic and porcelain home pieces. While they may not be the best in terms of quality, they can easily be had at affordable prices. Look out for the simple and classic tea sets. Have you been to Hanoi? Do share your recommendations with us too! Join us next as we enjoy a dinner at the Gourmet Corner Restaurant.